A significant percentage of veterans returning from wars exhibit symptoms of posttraumatic stress (PTS). This is now recognized as a serious health problem, but what about the victims of such violence? Refugees live with the constant reminder of what war has done to their lives and those of their families. 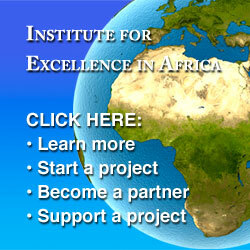 A randomized/matched study published in the April 2013 issue of Journal of Traumatic Stress (Volume 26, Issue 2, pp. 295-298.) 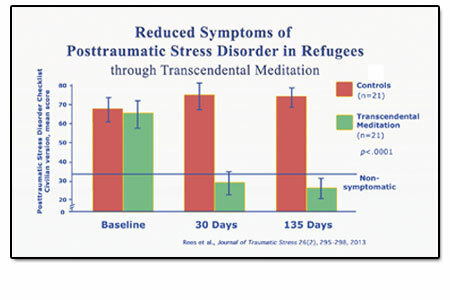 measured the severity of posttraumatic stress symptoms in refugees in Africa before and after learning the Transcendental Meditation (TM) technique. The reductions were dramatic. This graph shows the changes in PTS symptoms in the two groups. A drop in 11 points on this measure is considered clinically significant-visible improvements can be seen. TM practice led to three times the drop in posttraumatic stress symptoms after 30 days practice. The state of restful alertness gained during TM practice appears to reverse the damage done by traumatic experiences.Reductions in posttraumatic stress in African refuges replicate findings in previous research with Vietnam veterans and Iraqi/Afghanistan veterans. TM practice was more effective than psychotherapy in reducing anxiety,depression, insomnia, alcohol abuse, posttraumatic stress symptoms, and stress reactivity in 18 Vietnam veterans randomly assigned to group. Three-months practice of TM was also reported to decrease anxiety, depression, and posttraumatic stress symptoms in veterans from Iraq and Afghanistan.